The snow leopard is the indicator of the health and sustainability of the mountain ecosystem that provides water to up to 60 per cent of the world’s population (Central Asia and the Tibetan Plateau). For the people who share space with this magnificent cat, it is an important representation of their spiritual and natural wealth. October 23, the International Snow Leopard Day, is a reminder to the international community, civil society and the private sector that extends beyond the 12 countries where snow leopards are found, that it is our collective responsibility to conserve the species and its ecosystem. On October 23, 2013, political leaders from 12 countries came together for the first time to endorse the “Bishkek Declaration” on the conservation of snow leopards. It was a monumental feat where the President of Kyrgyzstan, Almazbek Atambaeyev hosted leaders from Afghanistan, Bhutan, China, India, Kazakhstan, Mongolia, Nepal, Pakistan, Russia, Tajikistan and Uzbekistan in the Global Snow Leopard Forum held in the Kyrgyz capital Bishkek, with a shared goal of conserving snow leopards and their fragile habitats. A comprehensive Global Snow Leopard and Ecosystem Protection Programme (GSLEP) was also launched on this day to achieve the ambitious goal of addressing high-mountain development issues using conservation of the snow leopard as a flagship. It was to commemorate this historic date and a watershed moment for snow leopard conservation that October 23 was chosen to be recognised as the “International Snow Leopard Day”. The snow leopard range countries have agreed to work together to identify and secure at least 23 snow leopard landscapes by the year 2020. This effort is being led by range country governments, and being supported by a host of international and national organisations such as the Snow Leopard Trust, Worldwide Fund for Nature (WWF), United Nations Development Programme (UNDP), and the Global Tiger Initiative. Snow leopard landscapes are defined as ecologically fragile zones that contain at least a 100 breeding snow leopards and sufficient prey. For a species with large home ranges spanning up to several hundreds of square kilometers, ensuring effective conservation in them would require biodiversity sensitive land use and development planning. It would require sustainable and socially responsible development through community-based efforts and business models to enhance livelihoods, policy initiatives and strengthening of laws to address traditional and emerging threats, local community involvement in conservation planning and implementation, and sustainability through capacity building, technology, research, resource mobilisation, multi-country information exchange and cooperation. Ranging between 4,600 and 92,000 sq km, these landscapes cumulatively cover 25 per cent of the global snow leopard range. Each landscape identified to be secured under the GSLEP programme is unique in its character, topography and threats faced by its biodiversity. It was recognised that management plans needed to incorporate mapping of important human habitats, wildlife habitats, corridors, existing and planned infrastructure and industries, organisation of priority wildlife areas, integrative and multi-sectoral conservation and economic development planning and implementation, and threats. These management plans are envisaged to serve as the blueprint of securing the landscapes. Currently, all range countries are at different stages of developing management plans for the identified landscapes.The management planning exercise should develop GIS maps of priority wildlife areas, multiple-use areas, habitation, and major on-going or upcoming infrastructure projects. Engaging with local communities is the mainstay of the GSLEP program that also advocates their active participation in planning and implementation of conservation and development programmes. Stakeholder meetings with representatives of all relevant sectors and agreements on organisation and management plan implementation should follow the on-going planning process. It is envisaged that the snow leopard landscapes will be officially recognised by their respective range countries as ecologically fragile zones leading to development and growth models that are not detrimental to the biodiversity. The foundation of the GSLEP programme are 12 individual national snow leopard and ecosystem priorities (NSLEPs) developed to prioritise action. These national priorities are buttressed by five global support components that transcend beyond national boundaries and include issues such as addressing illegal wildlife trade, trans-boundary cooperation, research and monitoring, knowledge sharing and institutional capacity building, and large-scale infrastructure development. 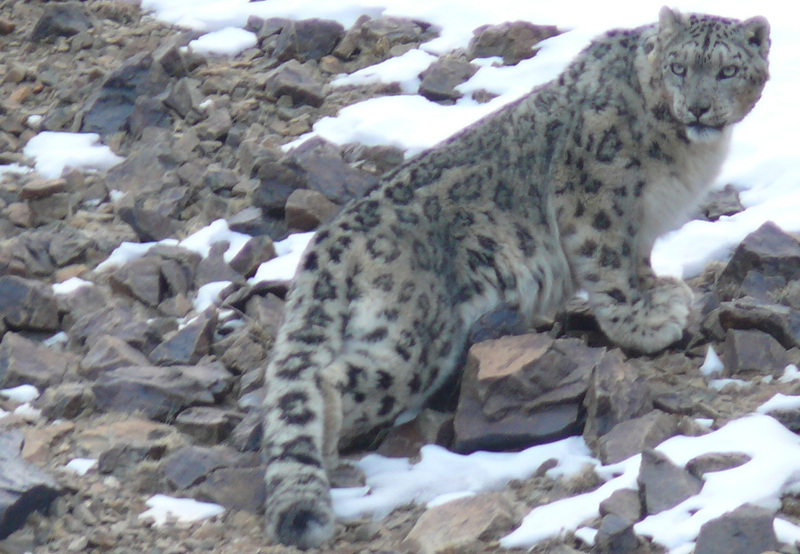 A multi-pronged resource mobiliorganisation strategy is being used to support the GSLEP programme, where it garners support from international financial institutions, country governments from within and outside the snow leopard range, various national and international partner organisations and industries. From initiatives such as establishment of a network across Central Asian countries to address illegal wildlife trade, to collaborating with local and international universities and other organisationations for capacity building, the programme is slowly gaining momentum towards addressing trans-boundary issues also. Some of the finest research is underway in some sites within the identified landscapes to understand snow leopard ecology, monitor population dynamics of predator and prey, make an economic evaluation of the provisional services people receive from the ecosystems, assess the anthropogenic threats and opportunities, study prevalence of diseases in wildlife and livestock, and project potential impacts of climate change on snow leopard landscapes.